Kefalotyri Cheese made with pasteurised sheep & goat's milk. Great taste 2015.A traditional Greek frying cheese for an intensely rich cooked flavour. Saganaki is the name given to a range of Greek dishes cooked in a small pan called a ?Saganaki'. 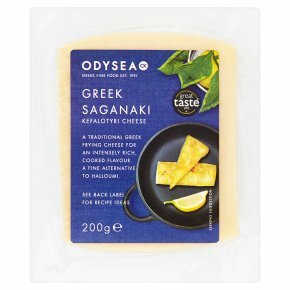 We've chosen a Kefalotyri cheese for our Saganaki, which is a hard, salty cheese with a slightly piquant aftertaste. Kefalotyri cheese is an ideal choice for frying thanks to it's high melting point, when fried the outside will become crisp while the inside remains soft. Kefalotyri is also good to serve cubed as a simple meze and ideal to grate or shave over pasta or gratin dishes. To fry simply dip into ice cold water, then cover in flour and shallow fry in olive oil until crisp and golden on all sides. Great Taste Awards winner 2015, where judges commented: "wonderfully comforting when cooked....we found this unusual and moreish"